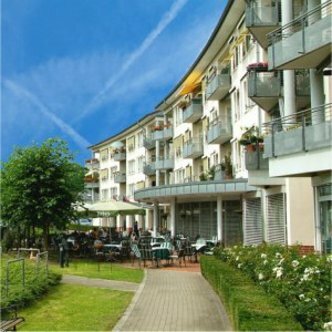 The TOP Residenz Hotel am Festspielhaus is a 4 star superior hotel and offers 38 comfortable rooms. All rooms with a size of 33 - 60 sqm are equipped in all three categories with kitchenette, bathroom with shower, hairdryer, TV, mini bar and balcony with overview over the garden or the small lake. All rooms are also ideal for long stay guests. Over 80 percent of the rooms are non-smoking rooms. A small supermarket and a hairdresser are also part of our service.